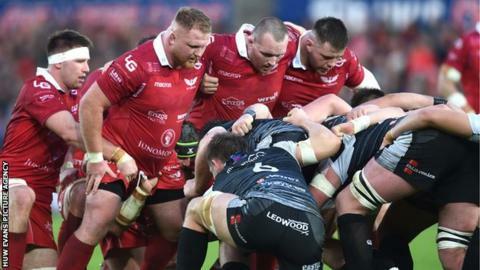 Wales rugby bosses will hold a "critical" meeting on Tuesday where the possibility of a merger between Ospreys and Scarlets will be discussed. The newly-formed Professional Rugby Board (PRB) will discuss the proposals as part of their plan to make the most radical change to regional rugby in Wales since 2003. Wales would still have four professional teams but leading figures in the Welsh Rugby Union want to introduce a professional side in north Wales. That would leave the number of regions being reduced from four to three in south Wales leaving four regions covering the north, south, west and east of Wales. The discussions between the WRU and regions has been dubbed as "Project Reset". Previous proposals had included merging Ospreys and Cardiff Blues but those plans fell through. The PRB is a gathering of representatives from the five professional entities in Welsh rugby - the WRU, plus regional sides Scarlets, Ospreys, Cardiff Blues and WRU-owned Dragons. They will meet on Tuesday where a merger between the two west Wales regions will be on the agenda. No final decision has been made and it is unclear when a new west Wales "super club" might start functioning, but it could be as early as next season and an announcement could be made by next Sunday. The Ospreys and Scarlets are traditional local rivals and have been two of Wales' most successful entities since the inception of regional rugby in 2003. Ospreys have won four league titles, while the Scarlets are the most recent winners with Pro12 success in 2017. Scarlets are based at Parc y Scarlets in Llanelli, while Ospreys train in Llandarcy and play their home matches at the Liberty Stadium which is owned by Swansea City Football Club. Where the side would play, what it would be called and kit colour would be ironed out if the proposal is accepted. The WRU have publicly stayed silent on Project Reset since a statement on 10 January where they said nothing was off the table and they would not shy away from tough decisions. Concerned senior Wales players met with WRU chief executive Martyn Phillips last week to discuss the future of regional rugby. JSG Cymru, the Joint Supporters Group which represents the four official supporters organisations for the Welsh regions, also met with Phillips and Ryan Jones, Welsh Rugby Union performance director, on Monday night. A JSB Cymru statement read: "As the Joint Supporters Group we have met tonight with Martyn Phillips and Ryan Jones from the WRU/PRB. "We have had a frank and open discussion about Project Reset and have been informed there is a critical meeting tomorrow (Tuesday)."